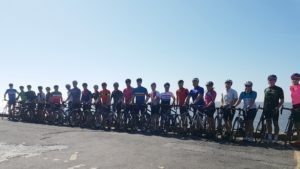 Dan Hopkinson, Head of Energy Market Insights and Network Services, reports on his most recent cycling event, and why he is definitely two-tired to do it again! “I am quite a keen cyclist. The passion started 20 years ago when I started cycling to work and has steadily progressed through mountain biking, trips to the alps and stages of the Tour de France (although a tad slower than the pro’s). Recently, Derby City Council kindly built our local village club an international standard velodrome, so I have taken to riding a bike with no gears and no brakes on an insanely steep indoor wooden track. Great fun. I am not the fastest cyclist in the world (not even in our club – that accolade goes to a 55-year old) but I don’t like getting dropped on group rides and I like to be in the mix on the odd occasion I get to race. One of the challenges with keeping fit is the balancing the needs of a career, family and being able to fit 10-15 hours of training into the week. This can be especially tricky when a ‘normal’ day in the office involves a 5-hour commute. We signed up in November 2017 so had three months to put summer behind us and get the lull out of the legs. Things started well for me with some decent base sessions in December out on the road and some sweet-spot sessions in the shed when the snow hit halfway through the month. Riding in the shed involves putting a bike onto a static turbo-trainer or rollers and churning out virtual miles. This is the least appealing form of training but is a necessary evil when the weather is bad or following very long days at work when you simply can’t get out on the road. I am lucky to have gotten hold of a Wahoo turbo through ElectraLink’s ‘cycle to work’ scheme (look on the Wiggle site if you are interested in getting one). The closure of the office over the Christmas break meant that there was plenty of time to get big miles in. I headed home, very much looking forward to ramping things up, but the reality was that I was ill all over Christmas and managed a grand total of zero miles! Deep breath… I still had six weeks to prepare. Then we started to talk tactics. Our middle-aged clan, which included an M&E engineer, a Professor of Veterinary Medicine, two geologists and a couple of managers decided that our best strategy had to be mapped out via a spreadsheet. According to our new bible, instead of doing long cycling stints at relatively low speeds we would be better doing short 20-minute ‘full gas’ efforts. The cycling equivalent of HIIT, you could say, but for much longer periods, and at a much faster pace than your typical high intensity regime. Great. That was the base training out of the way then. We spent January switching our planned training from endurance sessions, to short, more intensive bursts of effort during the week with our base miles saved for weekends. Getting in from work at a little past 8.30pm at night, then climbing on a turbo to do a session so tough you nearly faint took some commitment and was not exactly enjoyable. The day arrived. We turned up at the Velodrome at 9.30am on the Saturday morning. With ‘kick off’ at 12pm, we had plenty of time to set up ‘base camp’ and assess the opposition. 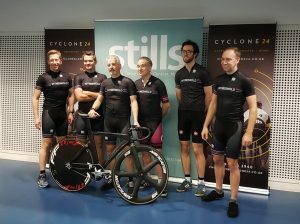 The event is described as consisting of a combination of serious riders and corporate teams raising money for charity. In total there were twenty teams including a few tandems with visually impaired ‘stokers’ (more on that later)! It quickly became clear that one team was the dominant force to be reckoned with. The Derby Institute of Sport had ‘encouraged’ a number of riders they support at elite level to participate. This included three members of the KGF Team Pursuit squad and national pursuit champions who had just won the gold medal at the recent world cup meeting in Minsk. Anyway… we got on with having the bikes checked to ensure we had the right track gear, with the event restricted to 88” to keep a level playing field. I won’t go into the intricacies of track gearing but 88’’ is fairly low, so you would have to spin your legs pretty fast to get decent speeds. I would usually ride a 93” and the Elite riders would probably be on a 110’’. At 12 p.m. I was first up and decided that to try and sit on the back of the national pursuit champion for my twenty-minute stint would make the most sense. It turns out this was a stupid idea as fifteen minutes in at maximum heart rate was not sustainable so when I handed over to my team mate I was wrecked. A quick check of Strava data showed that the KGF participant who I had chased round was just cruising at 28/29 mph. *Ouch*. We quickly settled into the rhythm of twenty minutes on, eat, rest, smash it, eat, rest, smash it. We spent the next twelve hours protecting second place from a team called Rogue Resolutions. This involved marking their riders and ensuring parity with their strong guys and doing more laps than them when their weaker rider was on the track. Key tactics were either to sit on the wheel of KGF (if you could) which simply means we sat in their slipstream conserving energy. We also looked to take advantage of the slipstream of the tandems. Especially those which happened to have a three-time gold medal winning Paralympian on the back lapping at thirty miles an hour! It was all looking good till about 10 a.m. – nearly twenty-four hours later, when we realised that our competition for second place wasn’t the team in third place after all, but the PKF Cooper Parry team in fourth place. They had sent one of their strong riders home for the night and he came back very fast. They quickly overhauled third place and came over the top of us with only about ninety minutes left. Ah well. We were seriously happy securing 3rd place and even more happy to find out we had broken the previous event record of 3792 laps. I have never put as much into a single event and getting to ride alongside (behind) some of the top riders in the country was a complete privilege. Would I recommend it to others? Yes, it is a brilliant challenge (an impressive £20,000 was raised for charity) and with the added bonus that it is not simply for experienced riders. Some of the participants had only set foot inside a velodrome once before and they, like me, got to cycle at a fantastic event, alongside the pros. Many thanks to Dan for this great account of what it’s like to take part in Cyclone24. Although we have a sneaky feeling Team Wymeswold may be back. We often hear, never again, and then…..we can’t wait for the next one! Our Derby challenge was a real mix of ability levels and we proud to say that Cyclone24 challenges are fun, friendly, inspiring and inclusive. Everyone is welcome. The Derby Arena challenge has now raised well over £25,000 for charity, so a huge congratulations and thank you to everyone who took part. Our Next challenge taking place at Derby will be on Saturday – Sunday 9th & 10th February 2019 and registration is already open. The above interview was taken from ElectraLink and can be seen in full here.